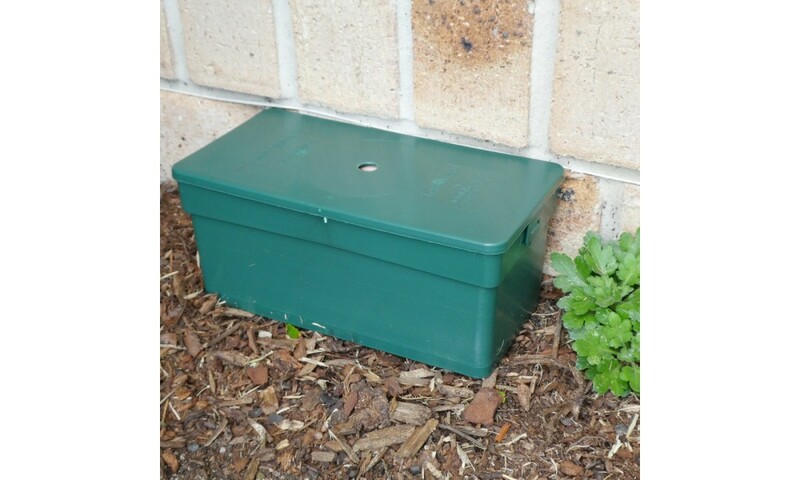 Place these Termite Monitoring Stations around the external perimeter of your house i.e. Gardens, paths, near wood piles, etc. All you do is simply place them ON surfaces. No digging or drilling is required. Spreading them is a 10 minute job you do once and they’ll last more than a decade. 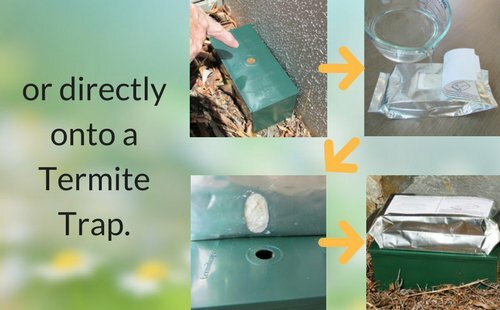 HOW DOES THE TERMITE TRAP SYSTEM WORK? Termites live in nests underground, often quite a distance from your house or property. Termite ‘scouts’ leave the nest to forage for food. 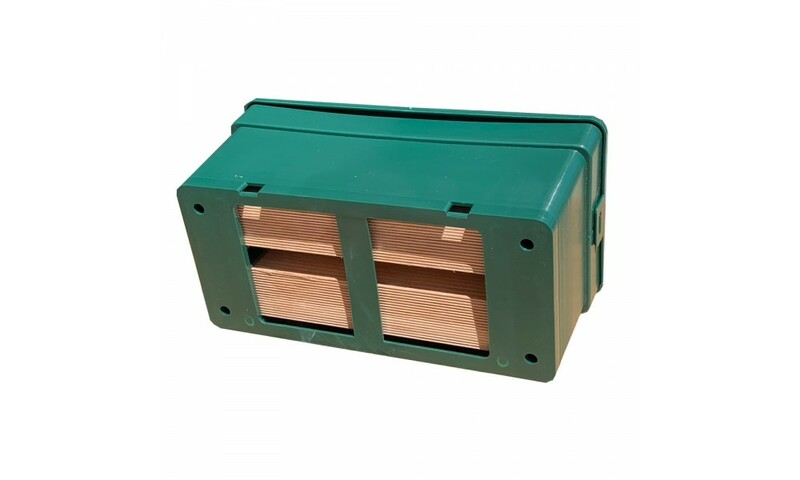 These Termite Monitoring Stations are filled with small replaceable pieces of Tasmanian Oak – timber that is very attractive to termites (as shown below). 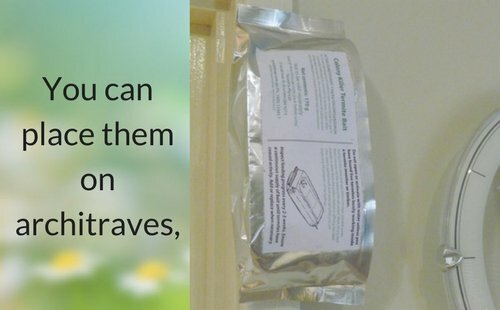 By placing traps around your house and garden you provide termites with an easy-to-find food source – once they have found the trap, they move in, seal it up, make it their own. 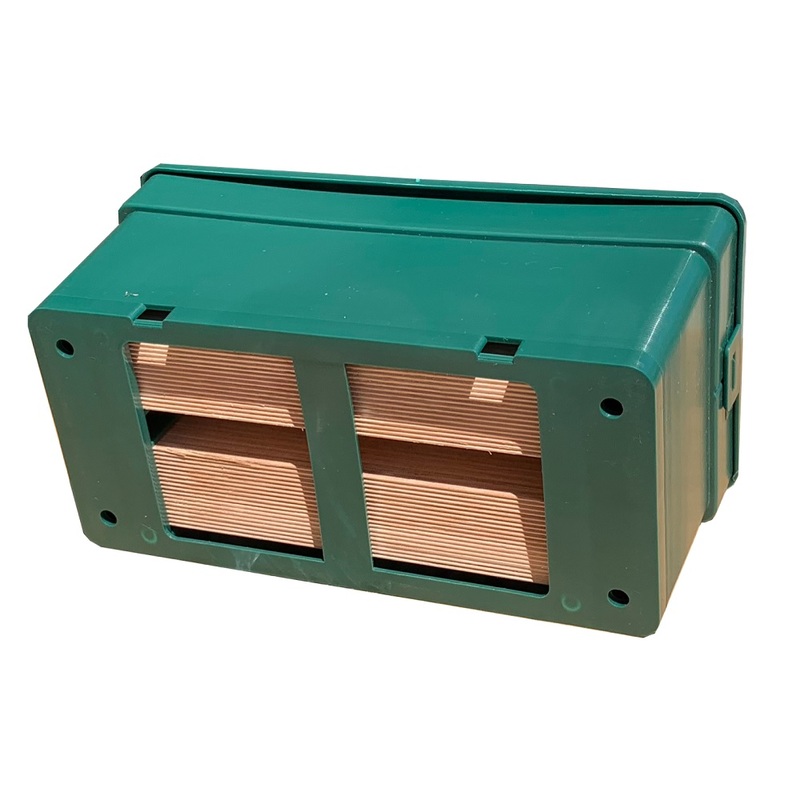 The idea is for Termites to find the Termite Monitoring Stations BEFORE they find your house. 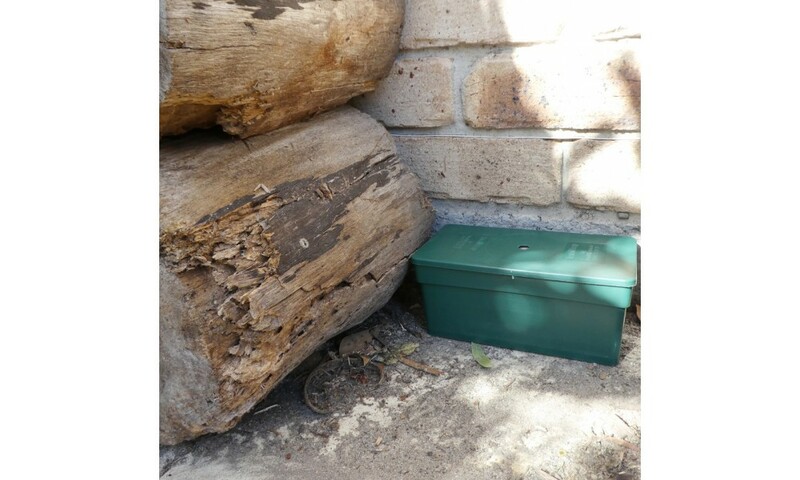 You should check the Termite Monitoring Stations regularly for active termites - usually every 2-3 months. Once Termites are active in a Termite Monitoring Station you can then bait them with Colony Killer Termite Baits and eliminate the colony. After a successful baiting, they can be refilled with more timber so the monitoring cycle continues. These are some of the areas suitable for placing the traps. 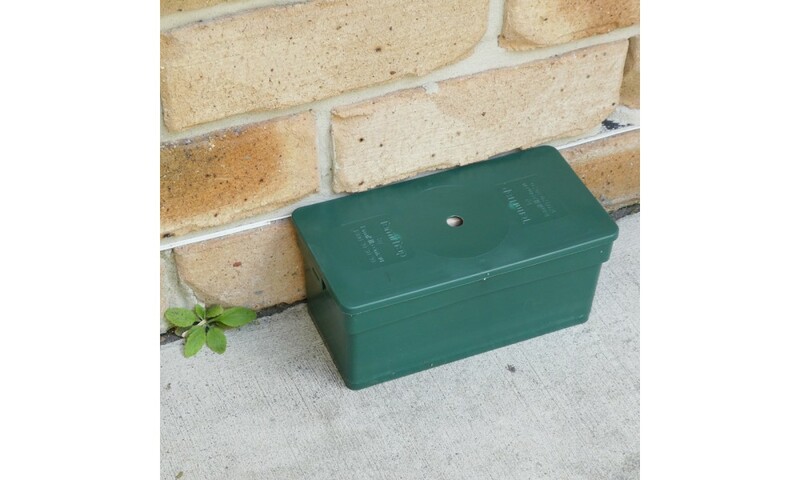 The patented design of the Termi-Brick allows you to quickly and easily see which traps have attracted termites – without disturbing them. Once inside the trap, their instincts drive them to block up the hole with mud. Once you find traps with this mud “we’ve arrived” signal, this is your cue to start the baiting process. Note - Bait is sold separately. CLICK HERE to purchase. 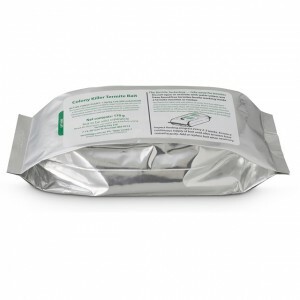 Termite Trap Colony Killer Bait contains an insect growth inhibitor called chlorfluazuron. It is deadly to the life cycle of the termites – but completely safe to you, your family, pets and wildlife. 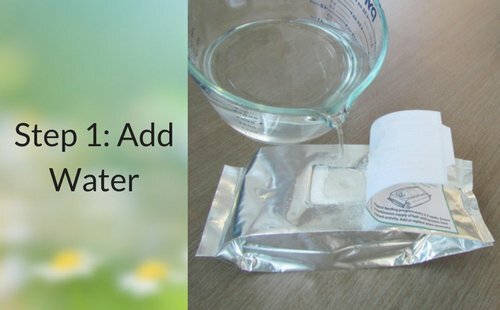 By using this bait you can kill off whole termite colonies – not just termites that you may have found in and around your house. 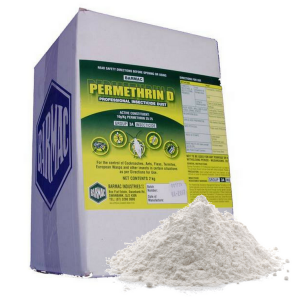 Check the Termite Bait every 10-14 days and replenish with a new bait as necessary until all activity has ceased. The termites take the bait back to the colony where it not only kills them – but the whole nest! It will take multiple feeds but it is the most certain way to kill termite colonies. 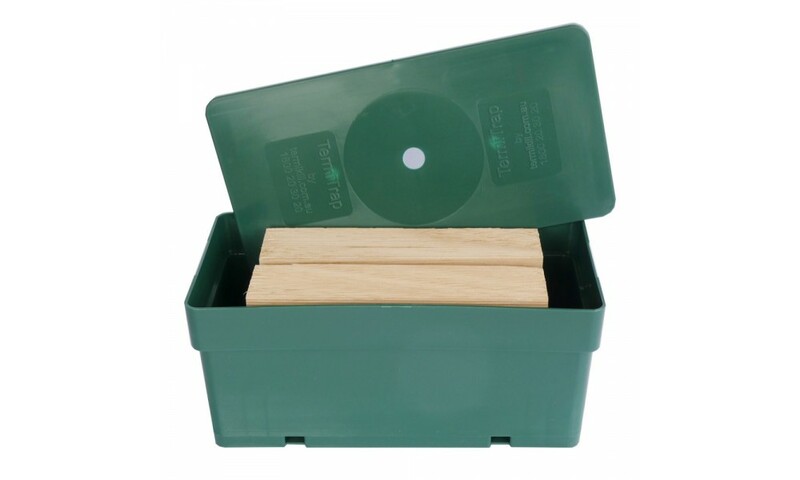 You are now an expert in the use of the simple but deadly TermiteTrap. 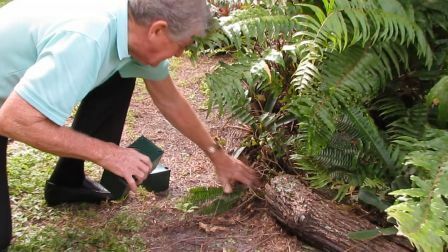 How do white ants / termites find Termite Traps? They send out scouts to find wood and, there is very attractive wood inside a Termite Trap. (The one recommended by CSIRO). 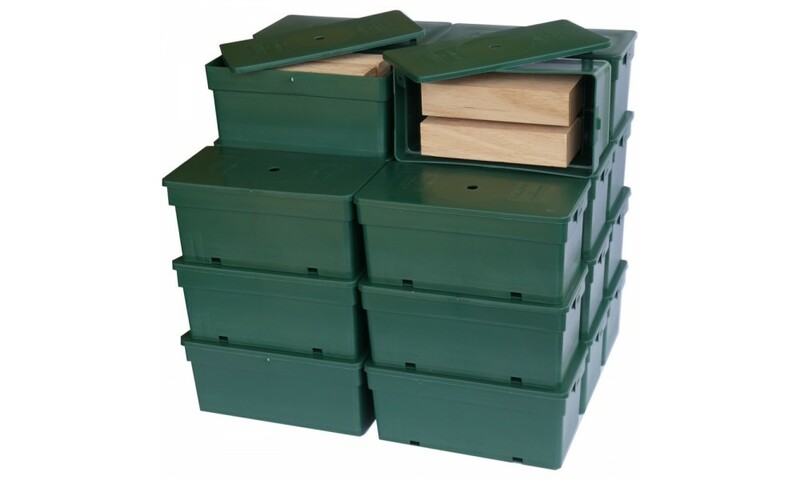 TermiteTraps are designed to be placed up on the ground rather than be buried in it. For millions of years, there has always has been more wood above ground level than under it, so the acquired habit of scouts is to go out above ground level to find timber. Another survival habit: termites do not rely on just one food source. They are constantly seeking supplementary food sources. Too many times there have been flash floods and bushfires or dinosaurs/mammoths have moved their main meal. To survive, multiple feeding sites became a necessity. 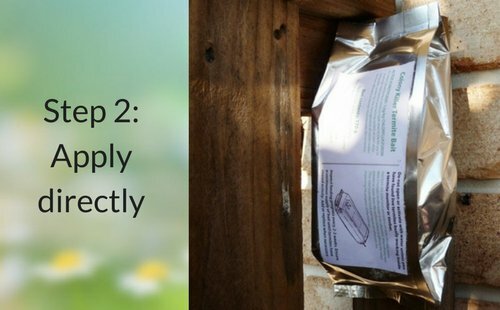 And, so it continues… The short answer: the more TermiteTraps you have placed around your home, above the ground where termite scouts are looking, the sooner and more likely you are to intercept scouts. Do monitors attract termites to my house? No. Termite scouts find monitors you have placed adjacent to your home simply because they were already there looking about. It could be argued that if they hadn’t found the Trap, they may have kept looking further and found a way inside. 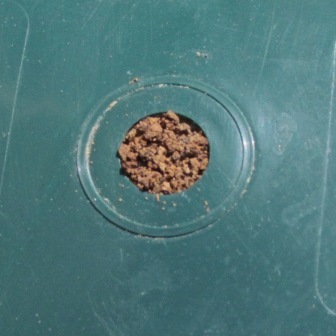 How do termites get into the trap? The bottom is mostly open apart from a ledge to keep the timber slats from falling through. There are also a couple of small holes at the bottom in the back wall. 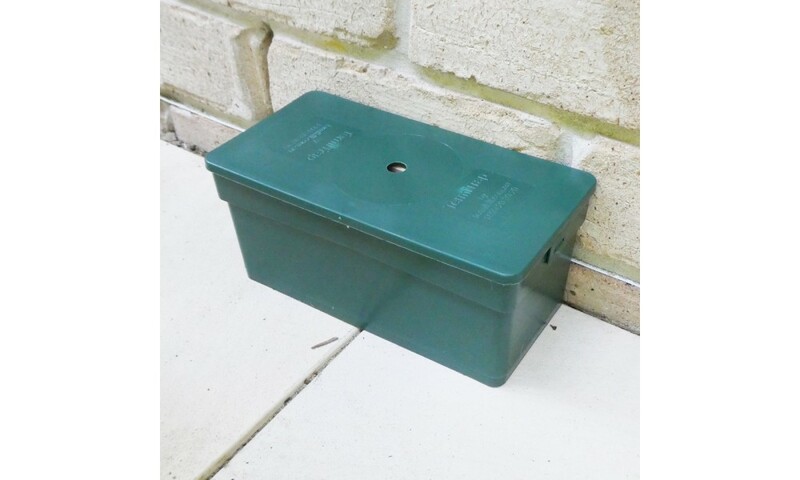 Traps can be placed flat on a concrete path against a wall over the expansion joint. 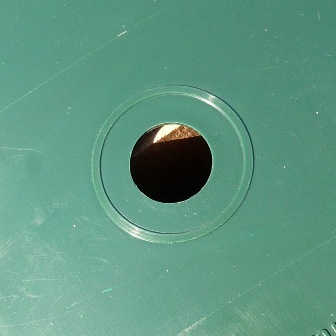 These joints often open up over time (weeds growing there are a good indicator) allowing termite scouts up to snoop about and find their way through those back holes to the timber inside the Trap. 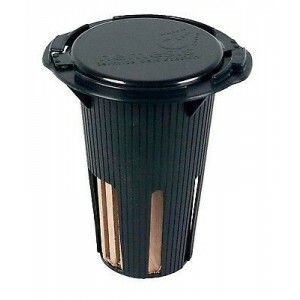 What are the dimensions of a Termite Trap? 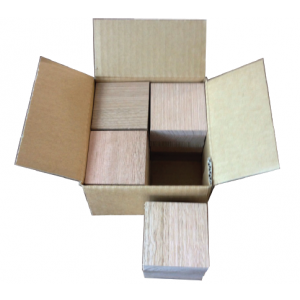 They are just less than the size of a house brick: 190mm x 90mm x 80mm high. 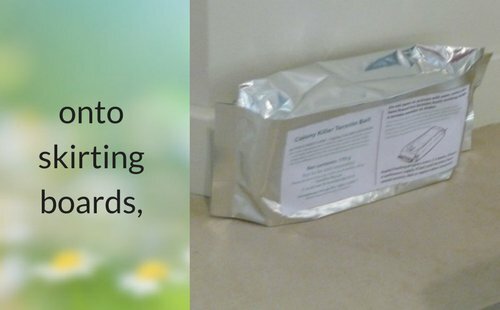 If termites are already in my house can I use Termite Traps to entice them out? Not a good idea. It takes time for scouts to find a TermiteTrap outside and then more time for the ‘construction team’ to build a tunnel to it. Then even more time to bait them. During all that time, they are still hollowing out the timbers in your house. If you can find termites busy eating timbers such as skirting boards, window or door frames, it is best to directly bait them right away. Why don’t you give precise distances between monitors or out from the house? Professionals are told (and tell you) the recommendation is no more than 600 mm from the foundation walls and 3 metres apart. This comes from the manufacturers of the monitors. They felt they had to put something in writing and after tedious committee meetings and discussions on trials and anecdotal common sense, that’s what was decided. Probably. 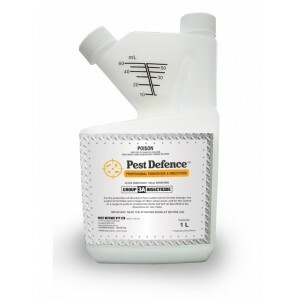 In reality, if you live in Australia (apart from Tassie where termites are not a problem) there is a high probability that termites will be scouting all through your back, front and side yards looking for alternative food sources. The distance out from the walls of the house is not really an issue. If there is a termite nest in a tree 30 metres away or, below soil level 3-30 metres away, scouts will be out looking everywhere they can and if they find something they consider worthwhile, tunneling is begun from their closest activity to the new food source. 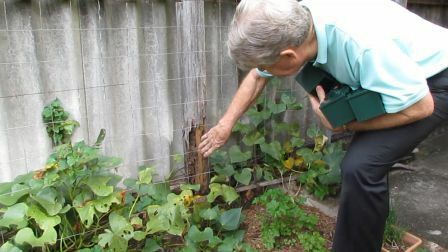 Which means, if they are out looking, they will find monitors whether they are placed right against the wall of the house on some pavers or, on the surface of your garden over near the fence. Traps do not encourage termites to your house; they find traps near your house because that’s where they were looking. We once sold cartons of 6 post-shaped monitors to be dug into garden beds. Six was about enough for a small town-house block. We tried to encourage customers to buy a second or third carton if they had a bigger block and more buildings. The extra cartons were seldom bought. 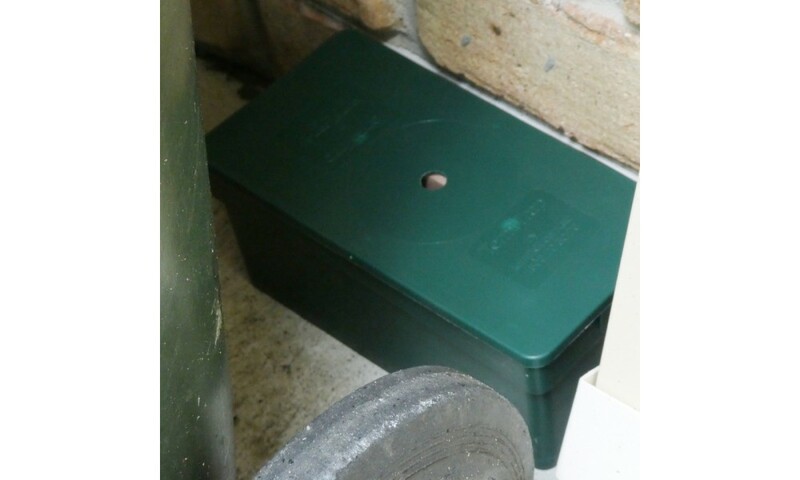 I felt many were jeopardising their home by wishfully thinking they had sufficient Traps. 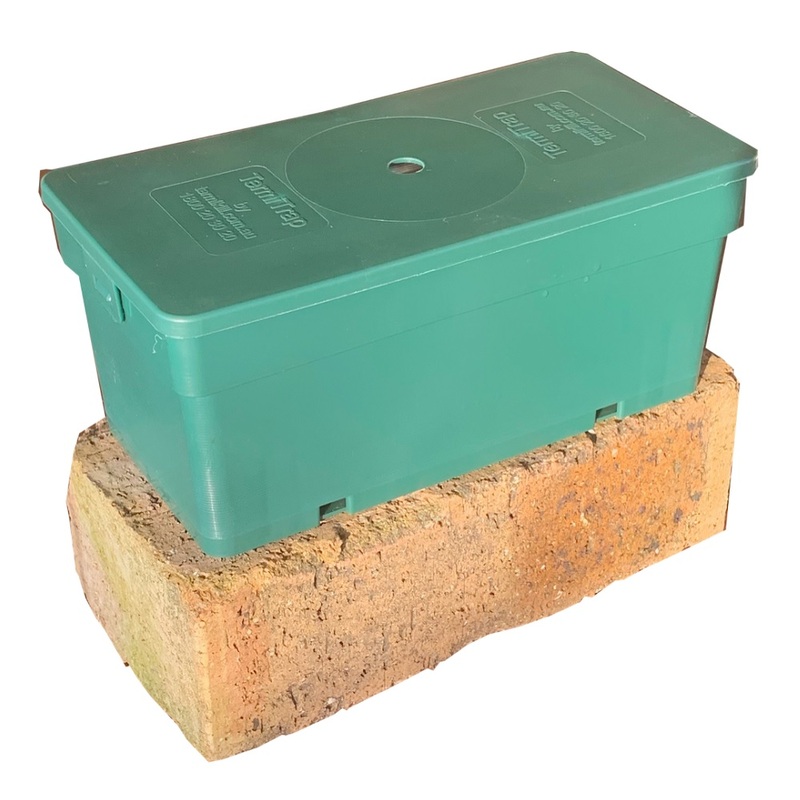 When the new TermiBrick was released it was about half the price per unit and could be put in more places, more easily. Such as on gardens and under shrubs, on pavers and over expansion joints in concrete slabs and paths. Now there’s 22 in a carton to cover the increased requirements. Homes are better defended by having more ‘sentries’ spread around in more places to intercept the forward patrols. Now the probability of a monitor being found is very high. If you have damp areas or you’ve found termites near a shed or in garden mulch, put a few close together to increase your chances. If you have a nature reserve over the fence or your neighbours have termite trouble, concentrate the numbers along those boundaries. If you really can’t use the whole 22 Bricks, give a couple to your neighbour(s) to increase the buffer zone around your home. Should I move the TermiBricks around if they aren’t attacked after a year? Termite scouts go to incredible effort and personal safety to find a new food source above ground. (Timber above ground level is the major source of termite tucker). Once found, the scout returns to the colony, submits details to a planning overview committee meeting to decide if what was found is worth the effort of building a tunnel to it. This committee decision goes to the construction resources committee which begins assembling a team for construction. You get the idea. Then suppose, with only millimeters before the tunnel reaches the Brick — someone shifts it! Or worse — the brick has been entered and the scaffolding is in place to seal the hole at the top so they can really get busy on succulent Tassie oak in humidified darkness and comfort — and someone shifts it! However you might feel for the termites, it’s not their feelings we need to consider. 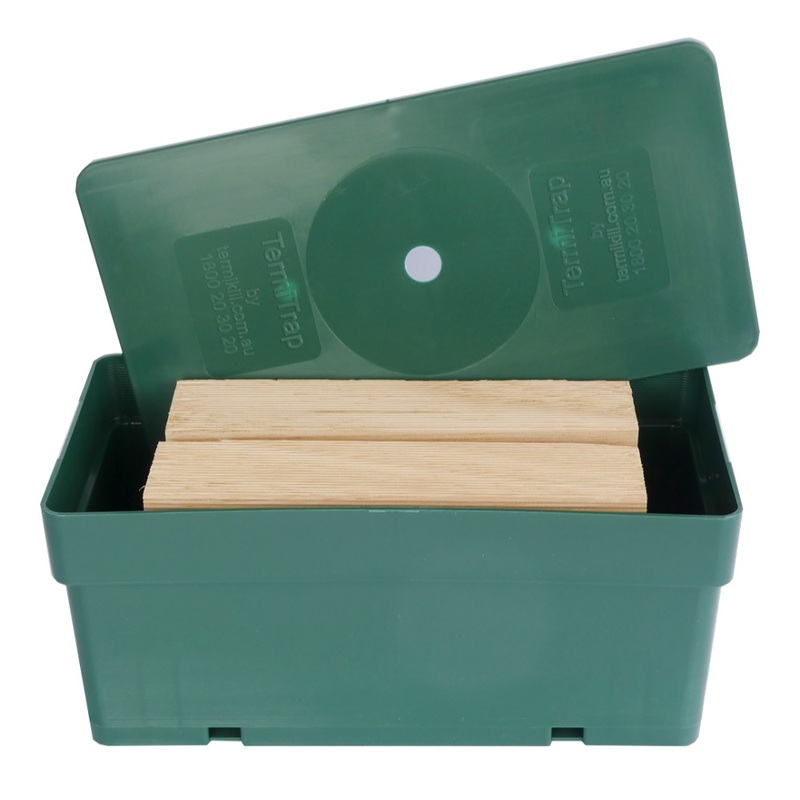 Before you shift a trap, first hold it steady with one hand while you open the lid and look inside. Any termites? Close it immediately, wait for the hole to be sealed in a day or so, then begin baiting. (And congratulate yourself for being aware). No termites? Well, if you really think you would have a better chance of intercepting termites somewhere else, pick it up and put it there! Don’t just shift them around because they haven’t been attacked. The one thing we can’t do is make termites find them; there may be no active colonies around (this year). But if next spring/early summer you see swarming termites or find equal sized wings on your verandah, it means they are out there somewhere and your TermiBricks are waiting, waiting. Is it legal for homeowners to buy and use your bait? 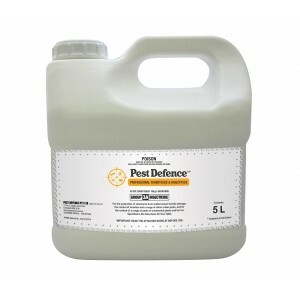 The Colony Killer Termite Bait is approved by the APVMA in Canberra (the Australian Pesticides and Veterinary Medicines Authority) for use by homeowners. I understand termites can do $50,000 plus in damage to a house in a short time. 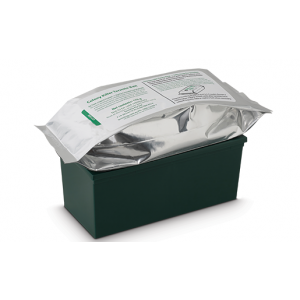 Doing something about the termite threat is obviously sensible, however, aren’t chemical barriers better value, even though more costly than termite monitors? Barriers installed during construction are one thing; barriers re-applied are different. You can’t jack up a building and start again. Holes drilled in slabs and tiled areas are injected to make interconnecting ‘puddles’ of insecticide underneath. If there is a soil crack below the slab, thousands of litres of pesticide could just disappear without puddling. 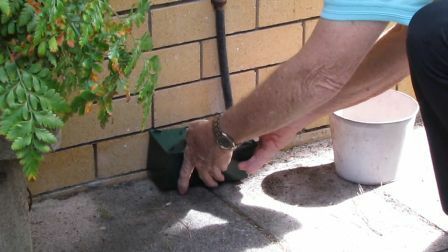 If there has been some subsidence and there is a space under the slab, the puddles may well join up but the termites may be tunnelling upside down on the undersurface of the slab where the pesticide doesn’t reach them. Sure, these are less likely examples, but here is another point to ponder: every year about 130,000 -150,000 houses in Australia are attacked by termites. Every time this happens, (and you see it all too often on TV news programs) termites have come up from the ground, crossed or bridged over barriers and done the damage. Every time. 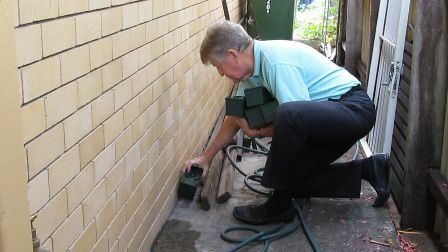 A barrier treatment can cost a couple of thousand dollars and lasts about 10 years before you need to do it again; a carton of Traps costs $440 and are guaranteed to last at least 10 years and, if you get a strike and successfully bait the termites, the Traps can be reused by adding more new timber. You can do the maths. If there’s a queen, that’s a nest. The most recognisable nests are mounds rising up out of the ground. 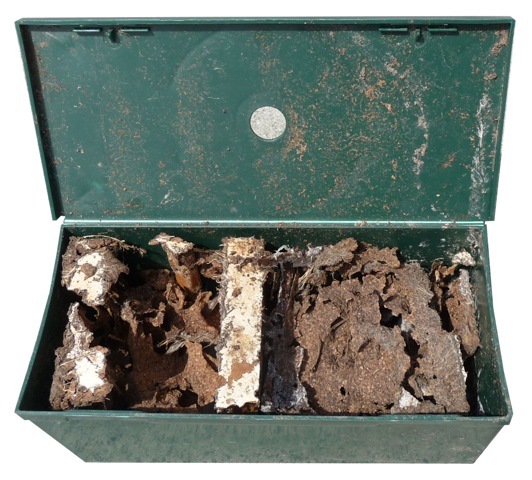 Serious termites usually nest in hollow trees or invisibly below soil level. There are often mud masses found under floors or between studs inside walls. Most often these masses are re-hydration areas where termites can recover from the drying out that occurs if they are too long away from moisture. Physically removing, destroying or spraying such masses will kill thousands of termites but, if the nest is underground some distance away, the access to that mass is sealed off by workers still in the safe zone below and away from the mayhem you’ve caused. The nest survives to come back from another direction. A mature queen can be laying a thousand or more eggs every day. It doesn’t take long for the numbers to rebuild. Read more about killing nests in trees, stumps and mounds.